Ginger, also known as Zingiber Officinale, is inaccurately referred to as “ginger root”. Due to the various health benefits of ginger, it is widely used as a spice or a medicine. Ginger has anti-nausea, anti-spasmodic, antifungal, anti-inflammatory, antiseptic, antibacterial, antiviral and antitussive properties that is highly effective for treating a number of health problems. Modern research confirms that ginger reduces nausea and vomiting, boost bone health, strengthen the immune system, increase your appetite, prevents various types of cancer, and relieve pains related to menstrual disorders. Arthritis-related problems with your aging knees? Regularly spicing up your meals with fresh ginger may help. In two clinical studies, it was found that 75% of arthritis patients and 100% of patients with muscular discomfort experienced relief of pain and/or swelling. Ginger has strong anti-inflammatory properties that can help treat the pain associated with arthritis and gout. Plus, You can add some ginger oil into your bath to help relieve muscle and joint ache. Ginger has a number of unique organic compounds which have actually been named gingerols – the major active component of ginger rhizome. Gingerols can increase uptake of glucose into muscle cells without using insulin, and may therefore assist in the management of high blood sugar levels. Experts recommend drinking one glass of warm water mixed with one teaspoon of ginger juice first thing in the morning to regulate blood sugar. Historically, ginger has a long tradition of being very effective in alleviating symptoms of gastrointestinal distress. It helps relax the gastrointestinal muscles, hence preventing gas and bloating. Also, health experts often recommend ginger to treat stomach ailments such as dyspepsia or colic. It is also frequently used in the treatment of bacteria-induced diarrhea. Eating whole ginger, drinking fresh ginger juice and inhaling diffused ginger essential oil are all highly effective ways to curb stomach disorders. While ginger helps common illnesses, it’s positive effect on more serious health conditions can not be disregarded. From ovarian cancer to colorectal cancer, ginger has proven helpful. The anti-cancer properties are attributed to gingerols, it has the ability to induce cell death (apoptosis) and suppress the production of certain proteins. Ginger also has the ability to combat other types of cancer, including lung, breast, skin, prostate and pancreatic cancers. Women suffering from menstrual pain can use ginger powder or ginger capsules to get relief. You can also drink ginger tea. In one study, 150 women were instructed to take 1 gram of ginger powder per day, for the first 3 days of the menstrual period, the ginger appears to be very effective against menstrual pain. Scientists believe that high levels of prostaglandins contribute to increased menstrual cramps. Ginger helps by reducing the levels of prostaglandins in the body, hence relieving the pain. Modern research later confirmed that ginger reduces nausea and vomiting from multiple causes: postoperative upset, chemotherapy treatments, and motion sickness. 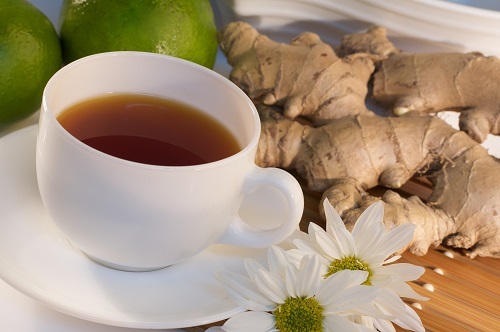 Especially, ginger appears to be highly effective against morning sickness, and only a small dose is required. You can chew some fresh ginger root or drink ginger juice or tea to suppress nausea. The health benefits of ginger don’t stop there. Click here to learn more. Slice the ginger as finely as you can and place it in a saucepan with the water. Bring to a boil, then turn the heat off. Cover the pot and let steep for 10 minutes. Pour 1 cup of the hot ginger infusion into a big mug. Squeeze in the juice of half a lemon. Stir in enough honey to make a sweet drink. You will need several teaspoons of honey per cupful. This is not a time to worry about cutting down on sweets – the honey has healing properties that are more important. Reheat the pot gently whenever you wish to make another cup of Ginger Lemon Tea and add the fresh lemon juice after the ginger infusion is poured into the mug (so you don’t destroy the vitamin C in the lemon juice by heating it too much). If making this drink before bed, omit the ginger and add a few tablespoons of rum to hot water, making a hot honey, lemon and rum drink to help you sleep. Very nice.